Before we get into the thick of what we’ve been working on, I am sure I speak for everyone here at Daylight when I say we had an awesome time at Indy Popcon. We met a lot of amazing people and got back some invaluable feedback from everyone that tried our demo. It was wonderful to see people enjoying our game and kicking back at our booth. 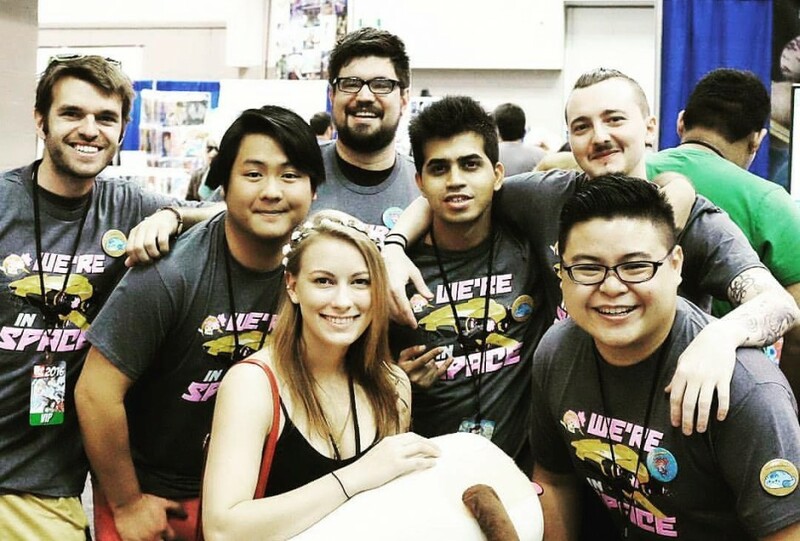 We made some friends along the way and we look forward to going back to Indy Popcon next year! 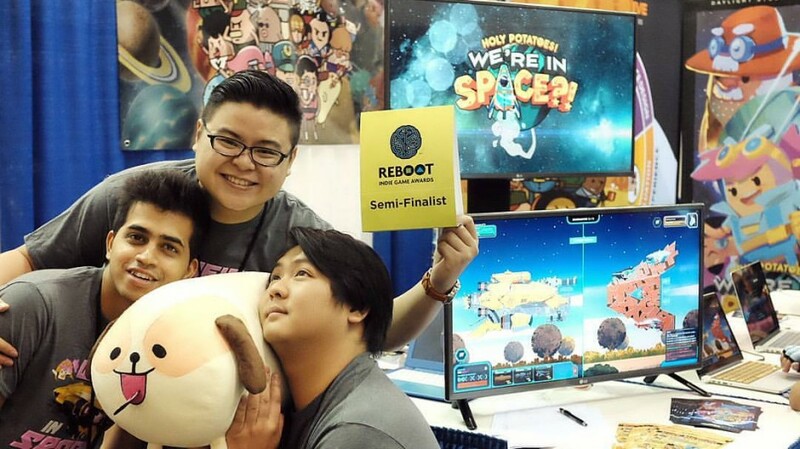 Not only that, we also got into the semifinals of the Reboot Indie Game Awards! Now, lets get into what has been going on at the studio! We have been working super hard on a demo of Holy Potatoes! We’re in Space?! For the most part, we have been toying around with ideas on how combat should work and how weapons should be balanced. To test some of the ways out, we ended up creating a table-top, MTG-like card game involving cards with weapon stats on them that players would pick out and use to battle a simulated enemy. Honestly, it was super fun to play that way and everyone in the office had a go and it was hilarious to see some of us constantly rolling 1’s and missing our shots. But I digress. We are still slightly tinkering with the battle system here and there, but it is mostly finalized at this point. The game is starting to be populated with animations and visual effects and the combat is starting to look and feel really satisfying! Below you will find a quick little gif of a boss battle showing off the player firing all their weapons and destroying the boss’s weapon! Also, here is the boss getting wrecked with one swift blow. Feels good man. We are aware that the camera shakes might be a little too intense for the time being and they are happening a little too frequently. We have plans of toning it down a smidgen and making sure that the camera shakes add to the game experience, not retract. 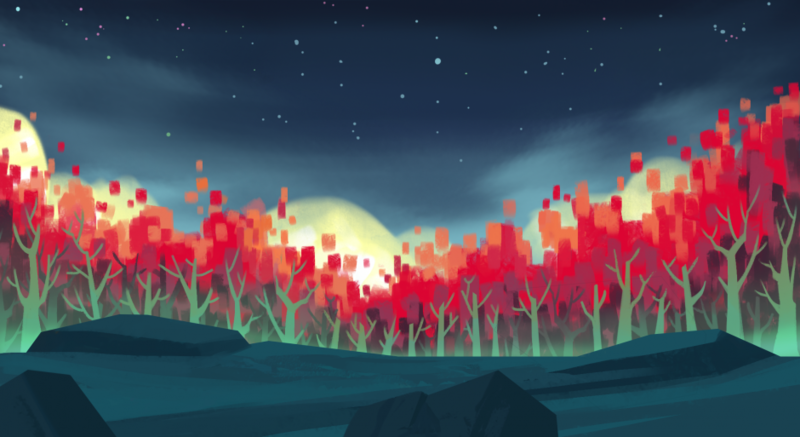 The Flame Forest animation is by far my favorite. The look of the flames and the colour scheme just work so well! The Diamond Wetlands, which are shown in the gif below, also have some awesome colours associated with it. The player is about to battle it out with a Macaroni battleship, which is inspired by alphabet pasta. Let us now step inside our battleship and get acquainted with some crew members and areas! As you can see from the gif above, our esteemed potato engineers are starting to populate the player’s ship. As of now, we have two fully functioning rooms; the control room and the crafting room. The gif above shows the crafting room in full effect. It goes without saying that the crafting room is for crafting weapons, but let me just explain the UI a little and how it works. Simply enough, you drag a weapon from the carousel at the bottom of the screen to a crafting station, and then drag an available engineer from the right onto the same crafting station. In a similar fashion, this is how you equip weapons in the control room. The control room is where you will be equipping weapons to take out to combat and where you assign your engineers. The last thing we wanted to show was the Exploration Complete screen. The animations are just so CUTE (and Fay is just never smiling)! That is all she wrote for this week’s Behind the Spud post. I hope this post has adequately caught you all up to what we have been doing at our studio! As for now, we are going to be continually working on the demo and we are gearing up to attend Gamescom in August and Tokyo Game Show in September!